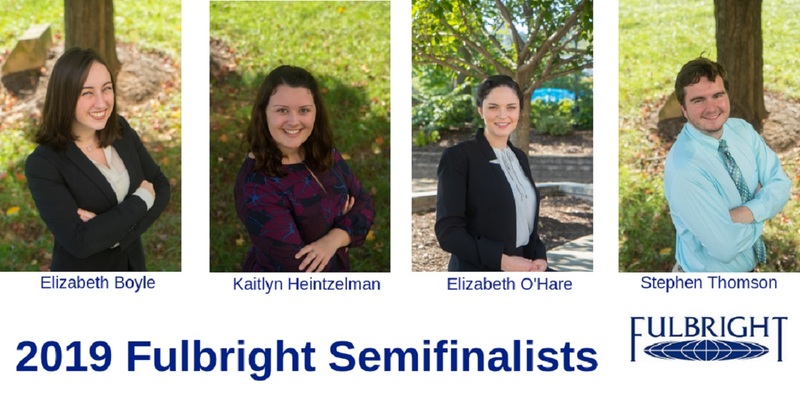 Four Mount St. Mary’s University seniors have been named semifinalists for the prestigious and highly competitive 2019-20 Fulbright U.S. Student Program. Elizabeth Boyle, Kate Heintzelman, Elizabeth O’Hare and Stephen Thomson are one step away from attaining a grant, which would allow them to continue their academic pursuits in the United Kingdom, Luxembourg, Poland and Costa Rica, respectively. Heintzelman, O’Hare and Thomson applied for English Teaching Assistant (ETA) Programs and Boyle applied for a Research/Study Grant through the Fulbright U.S. Student Program. The Fulbright U.S. Student Program is designed to provide research, study and teaching opportunities through grants in over 140 countries to recent graduates and graduate students. The ETA programs enable award winners to join local English teachers in their respective countries to provide assistance through teaching the English language as well as communicating and representing American culture. The Research/Study Grant allows recent college graduates and young professionals to develop and execute a unique research project for a specific country. Jamie Gianoutsos, Ph.D., competitive fellowships director and assistant professor of history, noted that four Mount St. Mary’s students have been awarded Fulbright ETA grants since 2015. Alyse Sphiehler, C’17, taught English on her Fulbright fellowship in Altacomulco, Mexico, last year. Two other 2017 graduates were awarded ETA grants to Kazakhstan and Argentina but declined them to pursue other studies. Brigid Flay is pursuing an MA at the Middlebury Institute for International Studies, where she is studying international trade and economic diplomacy, and Samantha Solis is earning a Ph.D. in English at UCLA, with a focus on contemporary American literature and Latin literature. John-Paul Heil, C’15, a finalist for the Fulbright ETA to Italy in 2015, declined the award to pursue his doctorate in history at the University of Chicago. The Competitive Fellowships Committee, comprised of Gianoutsos, Blackshaw, Thane Naberhaus, Ph.D., and Garth Patterson, Ph.D., oversaw these applications and conducted the Fulbright on-campus interviews. According to Fulbright, applicants who reach this stage will be notified if they have been selected, designated as an alternate or not selected between early March and late May, with dates to vary by country. 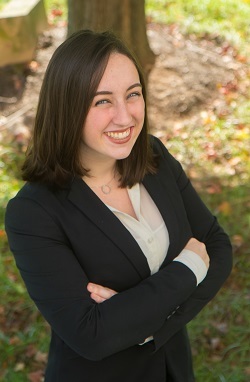 Elizabeth Boyle, C’19, an honors student and Founders Scholar, participated in the US-UK Fulbright Summer Institute at the University of Bristol for four weeks in the summer of 2017, studying the transatlantic slave trade and Bristol’s Atlantic history. Through a Research/Study Grant, Boyle would build on this work by completing the international slavery studies master’s degree at the University of Liverpool and volunteering at the International Slavery Museum. 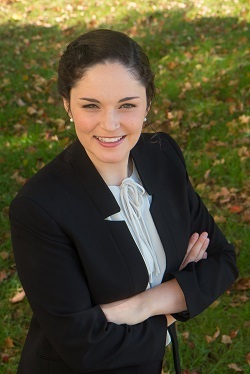 “Through coursework and through volunteering at the museum, I hope to contribute to ongoing discussions about the legacy of racial slavery in Britain and America,” said Boyle, who has completed six internships during her four years at the Mount, including summers at the National September 11 Memorial and Museum and the Summer Institute for the Gifted. 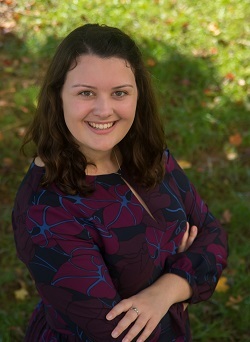 A history major with minors in education, African and African American studies and political science, Boyle plans to fulfill her desire to educate the public about slavery and its continued global legacies by pursuing a career as a historical scholar of the Atlantic slave trade in a university or museum setting. She plans to continue her studies by earning a Ph.D. in history or an MA in public humanities. She is grateful for the professors and museum administrator who wrote recommendation letters for her: Tim Fritz, Ph.D., Jamie Gianoutsos, Ph.D., and Amy Weinstein from the National September 11 Memorial and Museum. Kaitlyn Heintzelman, C’19, also an honors student, is a triple major in English, French and theology as well as editor of Moorings, the Mount’s literary journal. The Luxembourg ETA appeals to Heintzelman because of the country’s diverse community and generosity in accepting Syrian refugees. “By witnessing a society that treats foreigners as neighbors, I desire to understand Luxembourg, its struggles and successes, and to better understand my own country—and why we follow admirable ideals, but have trouble executing those ideals,” said Heintzelman, who noted that teaching English to Luxembourg students is the ideal way to experience the country’s multilingual and cosmopolitan culture. Serving as an ETA would help Heintzelman develop her teaching and language skills before she pursues graduate studies in French literature and becomes a French professor. She has tutored peers in French for two years at the Mount and possesses TEFL certification through CIEE. She spent a semester studying in Dublin, Ireland, and more than a month studying in France in the summer before her sophomore year. Heintzelman is thankful for the professors who wrote her recommendations: Ed Egan, Ph.D., Sean Lewis, Ph.D., and Marco Roman, Ph.D.
A leader in Mount Students for Life and previously in the Mount’s Health Professions Club, O’Hare seeks to devote her life to serving children and plans to pursue a graduate degree in the sciences or attend a school for medicine or midwifery to complete studies in pediatric or obstetric medicine. O’Hare is grateful for Katie Dye, Ph.D., associate professor of biology, Kristin Sites, assistant director of learning services, and Eric Jelin, MD, of Johns Hopkins University for writing recommendation letters. 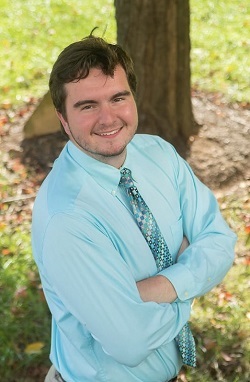 Stephen Thomson, C’19, an international studies major with Spanish and political science minors, was inspired to apply for the Costa Rica Teaching Assistant award by the demand that he saw for English instruction when he worked and volunteered in the country in the summer of 2018. “My passion for teaching English in Costa Rica stems from friendships forged within the country and from my firm belief that education is the key to global economic development, a view I have developed through studying international relations, economics and the Spanish language in college,” Thomson said. Thomson, who plans to become an international development policymaker focused on Latin America, began studying Spanish at the elementary (100) level at the Mount and achieved advanced proficiency in three years through his coursework and hard work. “As someone who learned Spanish in college without any prior experience, I will bring to the classroom empathy for those struggling to study English in the college setting and seek to establish a hospitable environment,” said Thomson, who earned TEFL certification through CIEE. Having seen impoverished areas of several Costa Rican communities, Thomson, an honors student and a member of the National Society of Leadership and Success, would also engage in communal efforts to alleviate poverty, help provide children opportunities and skills for development and strengthen connections he has with organizations in the country. Thomson appreciates the recommendation letters that Amanda Beal, Ph.D., Diana Rodriguez-Lozano, Ph.D., and Jennifer Soto wrote for him. For more information on the Fulbright U.S. Student Program, visit us.fulbrightonline.org.